Design a Dish using vegetables from our Local Seasonal Produce list and you could win a luxury dining experience worth £500! Norfolk Veg Box’s aim is to promote the use of local seasonal produce. We do this by bringing together produce from all over the county to create a one-stop-shop. To celebrate local seasonal produce, we have created a competition to get the Norfolk thinking about local seasonal dishes. Create a delicious dish using at least four local seasonal vegetables. You can add protein and any additional ingredients you wish. Once complete send your entry to info@norfolkvegbox.com. You MUST include name, address, telephone number, a photo of your final dish and your detailed recipe. Competition entry closes on the 31st October 2014 and all entries MUST be received before 5pm on this date. The competition will be judged once the competition is closed and the winner will be notified. Charlie Hodson, accompanied by his staff will cook a three course meal for you in your own home. Charlie will use some of the fresh vegetables from your luxury box plus some additional extras (all of which will be provided free of charge). You will be able to sit back, relax and enjoy fantastic service and beautiful Norfolk food. The entries will be judged by Charlie Hodson (head judge), Icarus Hines, Brendan Playford and Richard Ewin. Charlie Hodson, is a prestige chef having years of experience working in Rosette and Michelin starred restaurants all over the world. His experience includes working with Gordon Ramsey, opening restaurants in Selfridges and Harvey Nicholls plus cooking for Royalty. Most recently, he achieved two rosettes in a North Norfolk Restaurant and has now taken up a new post as executive chef at the Great Hospital, Norwich. Charlie is also a Norfolk Food and Drink Festival Champion. Icarus Hines is an amazing butcher who this year fought off fierce competition to win The Battle of the Bangers. Brendan Playford owner of Crush Foods. The crush range is all delicious, all natural, all local and all fun to eat! Richard Ewin, owner of Norfolk Veg Box, a keen supporter of local farms, growers and producers. All recipes entered MUST include at least four vegetables from our Local Seasonal Produce List which is available on our website. By submitting your recipe you agree to allow Norfolk Veg Box to use the recipe and photograph for marketing purposes. When we use your recipe we will include your name. 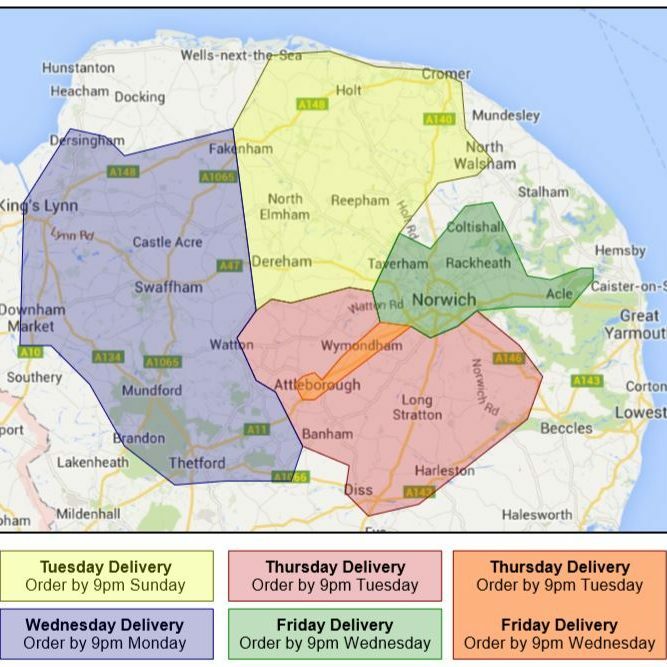 Entrants must be 18 years or older and live within the Norfolk Veg Box delivery areas. The competition will be launched at Porkstock on 27th September and all entries MUST be received before 5pm, Friday 31st October. The home dining experience is for a maximum of 8 people and a date will be arranged with the winner. The prize can not be exchanged for any monetary value.